Born: 8 August 1859, Forncett St Peter, Norfolk, England. Died: 6 May 1937, London, England. Henry F. (Harry) Wilson, barrister-at-law and British official in South Africa, was educated at Trinity College, Cambridge, where he was awarded the degree Master of Arts (MA) in 1885. Three years later he was called to the Bar. During the eighteen-nineties he was, among others, secretary of the Judicial Enquiry Commission, Trinidad (1892); private secretary to the Colonial Secretary, Joseph Chamberlain (1895-1897); and legal assistant to the Colonial Office (1897-1900). Following his stay on Trinidad he published "A list of Trinidad butterflies and moths" in the Journal of the Trinidad Field Naturalists' Club (1894-1896). In February 1900, during the Anglo-Boer War (1899-1902), Wilson was appointed legal adviser to the British High Commissioner in South Africa, Lord Milner, and in February 1901 became secretary to the British administration of the Orange River Colony (now the Free State). That year the University of the Cape of Good Hope admitted him to the MA degree on the basis of his Cambridge qualifications. In 1902 his post was changed to Colonial Secretary of the Orange River Colony, stationed in Bloemfontein. He served in this position until 1907, acted as Lieutenant-Governor of the colony several times, and was a member of the Inter-Colonial Council (Transvaal and Orange River Colony) from 1903 to 1907. During his term of office the main challenge facing the administration was to restore the economy of the former Boer republics. On 11 August 1902 he married the widow Isabella D. Anderson (n�e Smart). Wilson became a member of the South African Philosophical Society in 1900 and remained a member to 1907. In 1903 he played a leading role in the foundation of the Philosophical Society of the Orange River Colony and served as its president until he left the colony in 1907. Both he and his wife were elected honorary members of the society in 1908. In December 1903 he delivered a paper on "Natural history collections", in which he advocated the establishment of school museums and explained how these could be set up. The paper was published in the Transactions (1903-1907, Vol. 1, pp. 24-28). On later occasions he addressed the society on "The Zambesi and Victoria Falls" (Transactions, Vol. 1, p. 71), and exhibited the moth Angelica tyrrhoa (p. 72). His interest in natural history centred mainly around insect collection, particularly Coleoptera (beetles) and Lepidoptera (butterflies and moths). There are 73 specimens collected by him and R.B. Wilson [not identified] in the National Museum, Bloemfontein. Wilson was honoured as a Knight Commander of the Order of St Michael and St George (KCMG) in 1908. He subsequently held posts such as chairman of the British Overseas Stores, Ltd.; chairman of the North Charterland Exploration Company, Ltd. (1910-1928); secretary of the Royal Colonial Insitute (1915-1921); member of the Cambridge University Statutory Commission; and chairman of the Hereford branch of the Unionist Association. He was the editor of Builders of greater Britain and joint editor of United empire. Civil service list of the Orange River Colony, 1907. Philosophical Society of the Orange River Colony. Transactions, 1903-1907, Vol. 1. 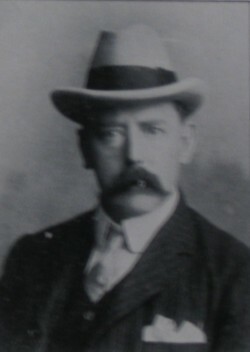 Robertson, H.G. Collectors of insects and arachnids in Africa; http://www.museums.org.za/bio/people/ as on 2001-4-26. South African Philosophical Society. Transactions, 1906-1907, Vol. 16-17: Lists of members. University of the Cape of Good Hope. Calendar, 1903/4.